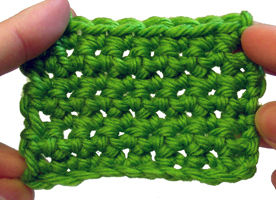 A Single crochet stitch is the most popular, basic and common crochet stitch. 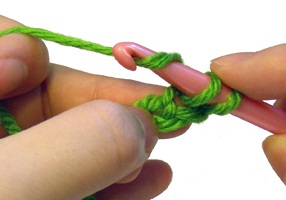 Single crochet stitches are used everywhere in the crochet world, so this is a great stitch to learn. If you are a beginner, this should be one of the first crochet stitches that you encounter. 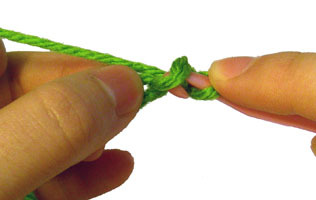 In this example of how to crochet a single crochet stitch, we will assume that you already created a foundation chain. This tutorial is for both right and left handed people. For left handed pictures, roll your mouse over the image and it will change for you. Insert your hook into the 2nd chain from the hook. You would now have two loops on your hook. 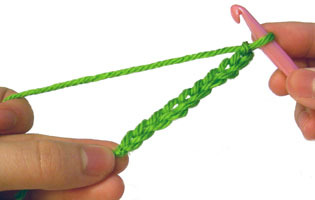 You insert your hook into the 2nd chain and not the 1st because 1 chain is equivalent to the height of a single crochet. This way, your corner will be the same height as the rest of the row. 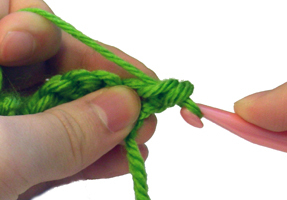 Yarn over (wrap the yarn over your hook). 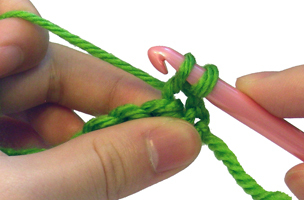 Pull the strand of yarn through the first loops that is on your hook. You should now have two loops on your hook. 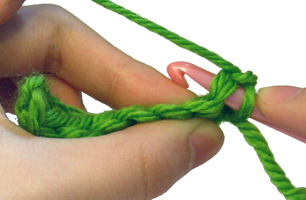 Yarn over again, and pull the strand of yarn through both loops on the hook. You should now only have one loop on the hook. Congrats! 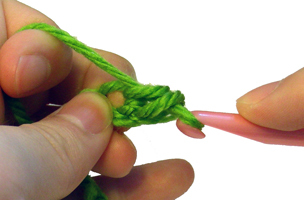 You just made one single crochet stitch! You can continue to make single crochets across your foundation chain. To do so, just insert your hook into the next chain, yarn over, pull through one loop on hook, yarn over, pull through both loops on hook. Continue this until you reach the end of the chain. Here is what one row of single crochets looks like! To make another row of single crochets, make one chain. Then turn your work. 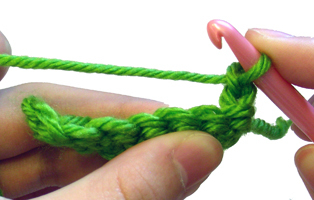 Insert your hook into the first single crochet. 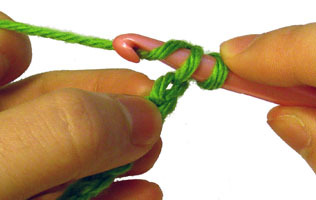 Pull the yarn through the first loop on your hook. You should now have 2 loops on your hook. 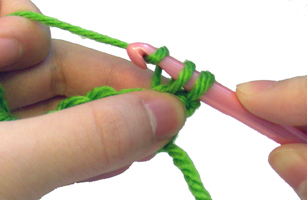 Pull the strand of yarn through both loops on your hook. You can continue to crochet across the row and create more rows of single crochet stitches. Here is what a few rows look like! Was this helpful? Do you still need more help? Leave a comment to let me know! This entry was posted on Friday, May 15th, 2009 at 12:00 AM by Rachel Choi	and is filed under Tutorials and Help. You can follow any responses to this entry through the RSS 2.0 feed. You can leave a response, or trackback from your own site. The lsc would be similar, but without the yarn over at the beginning of the stitch that the ldc has. I am crocheting an afghan that breaks the yarn off at the end of each row and leaves a fringe at the beginning and end. I am unclear attach how to attach the next row at the beginning. The pattern is the Indian Navajo. 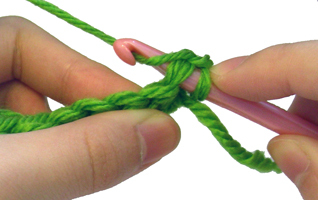 Depending on the pattern, you can start with a slip knot on your hook or you can just tie the end of the new yarn to the end of the last row. Rhea, I am doing the Navajo indian afghan also, but I haven’t done it for almost 15 years, and I hoped it would be like riding a bike, but not…..I had to figure out how to do the chain….now I’m just trying to figure out the sc/fringe thing…..what did you end up doing for the fringe…..I’m stuck on that too…..but I’m a year behind you. Are you finished now….would love to see picture. I just wanted to say THANK YOU!! I am teaching 15 girls to crochet this week and these tutorials are really going to help me and them! I LOVE to crochet and tend to work quite freestyle and I love how simple you have made these tutorials. A huge thank you to you and your team! I’m learning to crochet online and don’t have anyone IRL who knows how. I was getting pretty quick, even learned to crochet in the round & make ball toys for my pets. AND THEN…. I realized I’m confused and may have been doing it wrong. Can you help me understand something, if you get this please? So I think my main confusion comes from the fact that I watched a set of tutorials in which the first line after the chain was inserted into the top of the hoop only (like “FOS”). I didn’t realize I was doing anything wrong or was supposed to change after the 2nd line, so I’m pretty sure I’ve been just crocheting FOS only. Now I’m super confused about how to do a normal “single crochet” that isn’t FOS; so I continued in other words following the example for the 2nd line after the chain for the rest of my work and am not sure what the difference is now, haha! I’m looking at photo and even video examples but at this point am just finding myself confused (I’m not the greatest with learning from photos, but I’m trying! :)). As secondary questions, I just wanted to confirm the following, if I may? – At the beginning of the 3nd line (2nd line after chain) and all following lines, chain one and then begin crocheting in first loop (don’t skip a loop as was done on 2nd line)? All of the tutorials I’ve been watching sort of glaze over this stuff (or at least fail to mention the differences in steps in a way that really distinguishes them) in a meaningful way for me. 🙂 Thanks so much in advance! 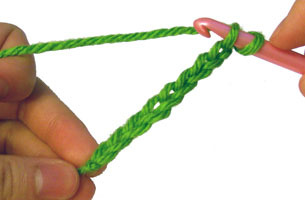 When you crochet in rows, you usually start with a chain 1 at the beginning of the row when working in single crochet. You will skip this one chain and work into the single crochet stitches. You won’t skip any single crochet stitches unless your pattern indicates to do so. You know you are working the stitches correctly if you end up with the correct number of stitches on your row when you are done. If you aren’t increasing or decreasing, you should have the same number of stitches on each row.